So, dear readers, I’ve decided I’m going to embark on the self-publishing journey once more. I’ve been working especially hard recently to save up money for life after my PhD, and I’ve just about got enough to invest in a new project. Yes, it’s a risk, but ultimately I’m not in it to make money – I’d like to have something to show for all my efforts over the years and something that (if I’m lucky) people might actually read. The cover is really important. The better the cover, the more likely people are to read buy it. Consider the paper type and quality. White paper stock doesn’t really work for fiction books. Make use of print-on-demand options. Much better (and cheaper) for self-publishing authors than the traditional ‘order X amount of books and then sell from your living room’ approach. Get someone else to do the formatting if possible. Pay to create an e-book version. 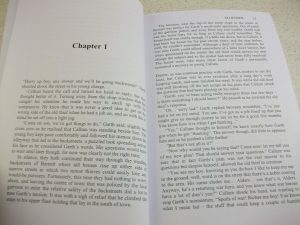 So now I’ve decided I’m going to self-publish, what next? Well given that I’ve now officially ‘announced’ it (and there’s no going back! ), the next step is to go back to the manuscript to double check a few things. I’ve already done a lot of revising and fine-tuning over the past year or so, but there are a few consistency issues I’d like to adjust slightly just so there’s absolutely no prior knowledge needed for the book to work on its own. After that, my next step is to research and contact various self-publishing agencies to see what’s on offer. I’ve already done a bit of research, and have an idea over the company I want to use, but I don’t want to be caught out in the same way I was back in 2010. Once I’ve found the company I want to work with the next stage after that will be working on them with a cover etc. That’s still some way off yet, but I will post regular updates as and when they occur. Ok, so 50k is probably more in long-novella territory, but the benefit of self-publishing is you have total control over what you put to print! Now this is an exciting turn of events! I will be pre-ordering this as soon as possible, as having read the initial trilogy and becoming enraptured in the journey of all the characters, I would be most interested to see the next steps.